Feeding kids with food allergies can be a challenge. Children tend to be picky eaters, and you can’t rely on the typical convenience store or vending machines. My KitchenAid® Convection Bake Countertop Oven is a great tool for cooking a variety of kid-friendly snacks. When I first start working with clients and cooking for them, I always bring along my KitchenAid® Convection Bake Countertop Oven; it’s so light weight that I honestly place in into a large tote bag and hop in a cab with it. What usually happens is the family falls in love with it and then end up purchasing their own. Why? Well, it’s surprisingly cheaper than most countertop appliances. Yes-it’s under $200 and worth every penny. No need to turn on the oven in the heat of the summer and no need to wait 15 minutes for your large oven to heat up. The KitchenAid® Convection Bake Countertop Oven takes less than 5 minutes to heat up and it’s a little ball of fire. I never had a toaster oven growing up but since I’ve introduced this to my family- they don’t know how they lived without it. It’s much quicker than a conventional oven and can be used to make everything from French toast to pizza. Easy, right? I’m sure you can all find those foods in your local food store. When you get home, organize them into days of the week like below. Then, check your pantry and refrigerator for clean ingredients that aren’t processed and don’t include gluten, dairy, food, GMO’s, food dyes or anything else that is harmful and irritating to someone’s digestive tract. Then, get a little creative like I did below. 1 organic avocado – Monday – 2 tablespoons ground flax seeds and 2 tablespoons extra virgin olive oil: Slice avocado in half, drizzle with olive oil and sprinkle with flax seeds, place on a baking sheet and bake at 350 degrees F for 15 minutes or until golden brown. Serve at room temperature. 1 organic banana – Tuesday – 1 teaspoon ground cinnamon: Slice the banana on the bias (at a roughly 45-degree angle) into 1/4 inch slices; sprinkle with cinnamon and place on a baking sheet; bake at 350 degrees F for 15 minutes or until golden brown. Serve at room temperature. 1 organic bunch fresh kale – Wednesday – 2 tablespoons extra virgin olive oil, 1 teaspoon chili powder: Wash kale, cut off the tough ends and discard. Chop kale leaves into 1/2 inch pieces, drizzle with olive oil and sprinkle with chili powder. Place on a baking sheet and bake at 350 degrees F for 15 minutes or until golden brown. Serve at room temperature with sea salt. 1 organic chicken breast – Thursday – 2 tablespoons extra-virgin olive oil, 1 teaspoon oregano, 1/2 teaspoon paprika, 1 tablespoon Dijon mustard: Slice chicken breast in half; drizzle with olive oil, sprinkle with oregano and paprika; place on a baking sheet and bake at 350 degrees F for 20 minutes or until golden brown. 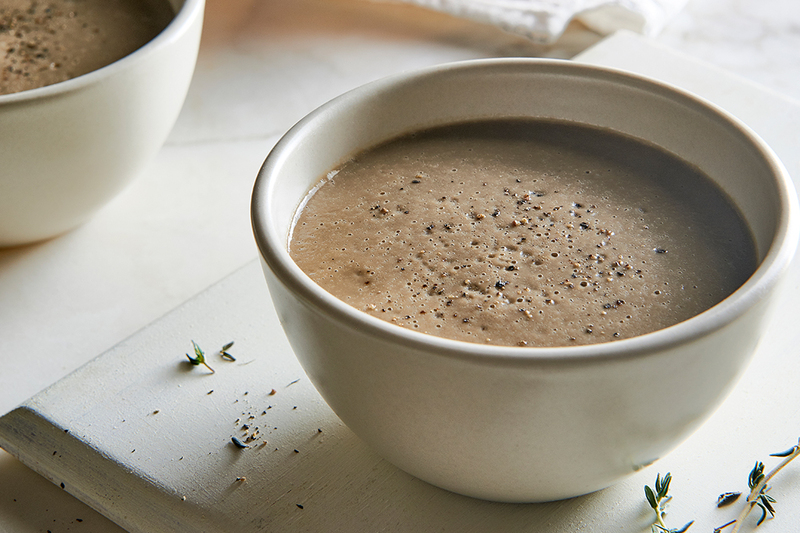 Serve at room temperature with a dollop of Dijon mustard on the side. 1 bag raw organic almonds – Friday – 3 tablespoons honey, 1 tablespoon sesame seeds: Place almonds in a large bowl; toss with honey and sesame seeds to coat. Transfer almonds to a baking sheet and bake at 350 degrees F for 15 minutes or until golden brown. Serve at room temperature. See how easy it can be? Go ahead, give it a try this week. 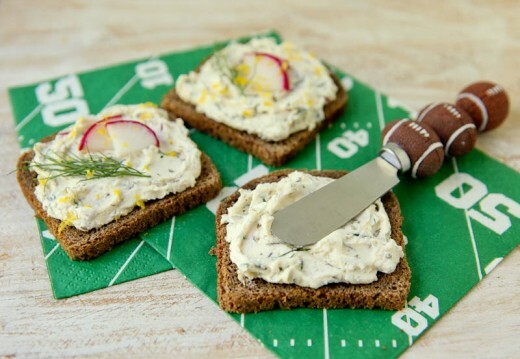 Then when you’re done with your fun weekly experiment, you can check out these other healthy and allergy-friendly go-to snacks that will satisfy even your pickiest eater. Each of these snacks contain fiber, lean protein, complex carbohydrates and healthy fats to keep your kids healthy and full. When I’m working with families whose children have food allergies, the name of the game is to have fun! No deprivation is allowed and I always make sure the children feel included and welcome at every meal and snack when everyone else is chowing down on meals filled with gluten, dairy, soy and GMO’s. Coconut Banana Bites – Bananas are a great filling snack and you can make them sweet without any added sugar by slicing 1 large banana on the bias and sprinkling each slice with 1/2 teaspoon cocoa powder (or raw cacao), 2 tablespoons unsweetened coconut flakes and 1/2 traspoon ground cinnamon. Place on a baking sheet and bake for 10-12 minutes at 350 degrees F in your KitchenAid® Convection Bake Countertop Oven. Set aside to cool before serving. Grain-Free Paleo Granola – Granola can be a tricky choice for those with food allergies, but you can use a toaster oven to bake a batch of this yummy snack using oats and other gluten free grains. Add some flavor with nutmeg and cinnamon. In a large bowl combine 1 cup dried cranberries, 1/3 cup coconut flakes, 1/3 cup honey, 1 teaspoon ground cinnamon, 1 cup pumpkin seeds and 1 cup chopped walnuts with 4 tablespoons melted coconut oil; mix well to combine then toast in the KitchenAid® Convection Bake Countertop Oven at 275 degrees F for 20-25 minutes or until golden brown. Set aside to cool before serving. Dried Mango – Peel and slice mango into thin strips; place on a baking sheet and place in your KitchenAid® Convection Bake Countertop Oven at 200 degrees F for 1 hour or until mango is dried out. Set aside to cool before serving. 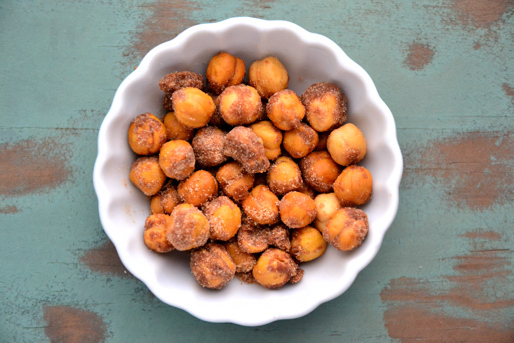 Sweet Cinnamon Chickpeas – Combine 1 can drained chickpeas with 1 tablespoon ground cinnamon, 1 1/2 tablespoon melted coconut oil, a pinch of sea salt and a 1/4 teaspoon all spice. Bake on a baking sheet in your KitchenAid® Convection Bake Countertop Oven for 20 minutes at 350 degrees F or until golden brown. Set aside to cool before serving. Cha Cha Chia Coconut French Toast – This is a sweet spin on your classic French toast. Simply coat two slices of gluten-free bread in a bowl of 2 beaten eggs; toss to coat entire slices of bread. Then, sprinkle with 1 teaspoon ground flax seeds, 1 tablespoon ground chia seeds and coconut flakes. Bake in the KitchenAid® Convection Bake Countertop Oven on a baking sheet for 15-20 minutes or until golden brown. Set aside to cool before serving. Spinach and Tomato Quesadillas – Toaster ovens are great for making quesadillas. Use gluten-free tortillas and keep it healthy with veggies like spinach and tomato along with dairy-free cheese. Set your KitchenAid® Convection Bake Countertop Oven to 325 degrees F and bake for 20 minutes or until cheese is melted. Set aside to cool before serving. Zucchini Fries with Cilantro Hummus – French fries are a popular kid-friendly treat, but they get no points for nutrition and aren’t an option for those with food allergies. Make an allergy friendly version by slicing zucchini, topping with olive oil and toasting in your KitchenAid® Convection Bake Countertop Oven at 300 degrees F for 15-20 minutes or until golden brown. Set aside to cool before serving. Meanwhile, in a large bowl, combine 1 cup of plain hummus and 1/4 cup fresh finely chopped cilantro; mix well and serve with zucchini fries. Homemade Honey Mustard with Rice Cakes – Top whole grain rice cakes with organic honey mustard and ground cinnamon for a sweet mid-day treat. Set aside to cool before serving. Homemade Bagel Bites – Bagel Bites are another kid-friendly favorite. Use gluten-free bagels, slice them in half, top with tomato sauce, sprinkle with dairy-free cheese and toast until cheese is melted and bagels are golden brown. Set aside to cool before serving. Toasted Pumpkin Seeds – These are a great snack anytime of the day. Just toss a handful of pumpkin seeds in a large mixing bowl with olive oil, sea salt, pepper and your favorite dried herb such as basil. Bake in your KitchenAid® Convection Bake Countertop Oven at 350 degrees F for 20 minutes. Set aside to cool before serving. Broiled Blood Oranges – Blood oranges are filled with amazing flavor. You can easily broil them by putting them into your KitchenAid® Convection Bake Countertop Oven at 450 degrees F (Broil) , top with coconut sugar and bake for 20 minutes or until golden brown. Set aside to cool before serving. Banana S’mores – This is such a fun dessert for kids in the summer and during the winter holidays! Melt marshmallows and dairy-free chocolate in the KitchenAid® Convection Bake Countertop Oven at 300 degrees F. Serve over a peeled banana and sprinkle with gluten-free graham cracker crumbs and a scoop of coconut milk ice cream! Set aside to cool before serving. Preheat KitchenAid® Convection Bake Countertop Oven to 225 degrees F.
Cut apples into thin slices. 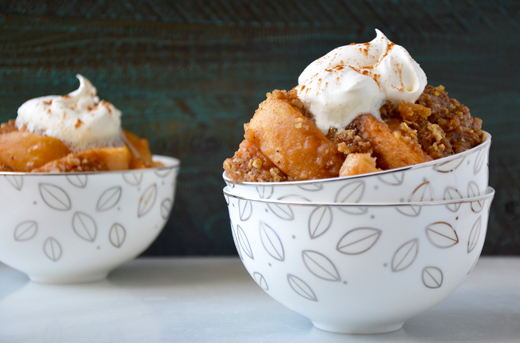 In a large bowl, combine cinnamon and sugar; add apple slices and toss to coat. Place on a baking sheet and bake for 45 minutes or until golden brown. Turn off the oven but keep the apples inside the oven until they are cool.